As much as Tony the Tiger may urge us all to eat a complete breakfast, many people – children, teens, & adults – start their day without first eating breakfast. Morning routines can be hectic, so much so that it can be tough to find the time to eat something for breakfast at all. So why should you eat breakfast, exactly? 1. Energy! Your body, & that of your child, needs regular refueling, waiting all the way from dinner to lunch the next day – perhaps 18 hours – without giving your body more fuel is just not a good idea. Breakfast sets you up to have more energy, do better in school or at work, & eat healthier throughout the day. 2. Get your vitamins & minerals. People who skip the first meal of the day are unlikely to make up their daily requirement for some vitamins and minerals that a simple breakfast would have provided. 3. Breakfast is an important factor in maintaining a healthy body weight. Skipping breakfast – or any other meal – can make controlling one’s weight tougher, because, as some studies suggest, people tend to add more body fat when they eat fewer, larger meals than when they eat the same number of calories in smaller, more frequent meals. While some people are able to control their weight while skipping breakfast, breakfast skippers tend to eat more food than usual at the next meal, or nibble on high-calorie snacks to stave off hunger. 4. If you eat breakfast, your food choices the rest of the day are likely to be better. 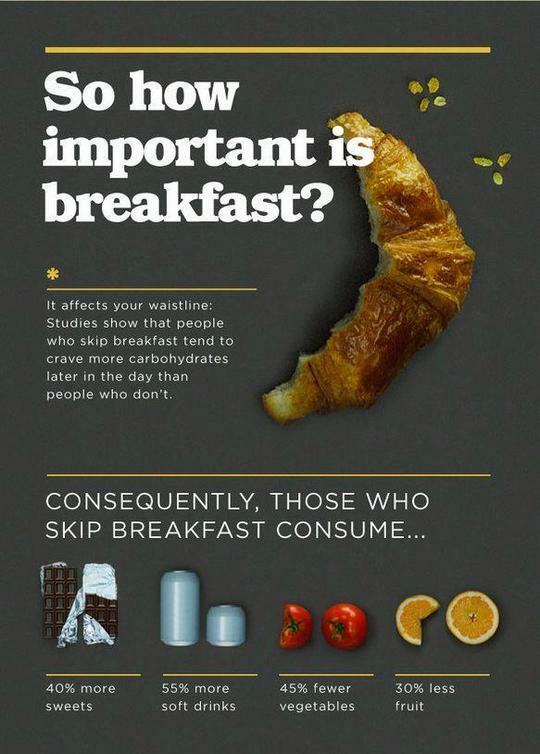 If you skip breakfast, you are more likely to crave carbs later on. People who skip breakfast have a 40% greater tendency to eat more sweets, drink 55% more soft drinks, eat 45% fewer vegetables, & eat 30% less fruit. And, interestingly, studies show that kids who skip breakfast are tardy and absent from school more often than children who eat breakfast on a regular basis. So what makes a good breakfast, & how can you get yourself & your kids in the habit of eating it? Replace or accompany that morning cup of coffee with a glass of orange juice or milk. Make an omelette! You can shorten preparation time by chopping up your vegetables ahead of time. 2. Plan ahead to eat breakfast. If you don’t plan it, it likely won’t happen. Pick up portable breakfast items when at the grocery store. You should buy foods like fruit, yogurt, whole grain breakfast bars, or granola bars for those mornings when you have to eat breakfast on the go. Preparing a good breakfast can be as quick and easy as splashing some milk over cereal, or making oatmeal or a healthy smoothie. Get up 15 minutes earlier. You can fix and consume a healthy breakfast in 15 minutes or less. 3. Consider enrolling your children in a school breakfast program, if possible, or pack a breakfast brown bag or smoothie the night before that they can eat on their way to school. So do yourself a favor, & encourage your kids to get the habit of it, too – eat a healthy breakfast every day!